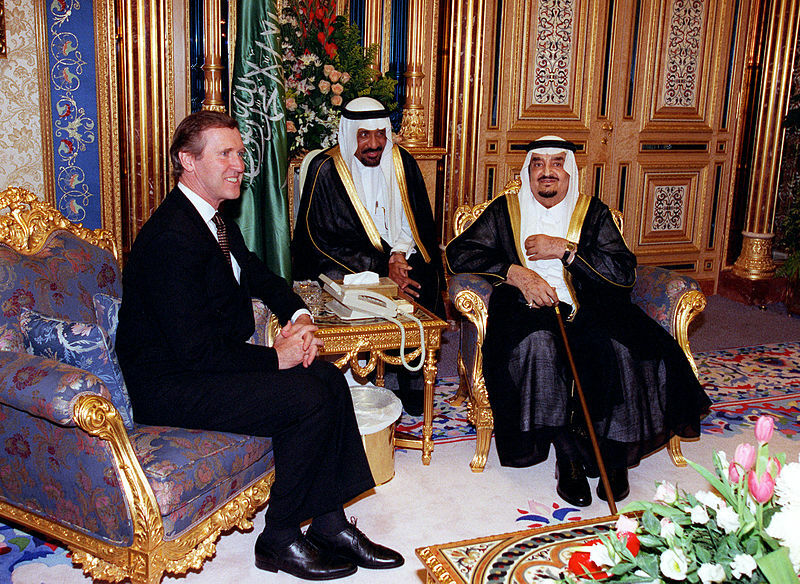 Since Fahd ibn ‘Abd al-‘Azīz Āl Sa’ūd ascended to the throne of Saudi Arabia in 1982, relations between the West and Saudi Arabia have been fairly stable, if somewhat complicated. The Saudi government has remained consistently willing to maintain close diplomatic, business, and military ties with the US and other Western nations. At the same time, it has supported Wahhabi religious leaders in maintaining extremely conservative Sunni religious dominance over Saudi citizens. While the West enabled technological and business modernizations in Saudi Arabia, the Saudi government to a great extent allowed the Wahhabi religious leaders to define culture in their country. Saudi Arabia’s dichotomy of petroleum-fueled modernization versus conservative Wahhabi cultural control has been somewhat baffling to Westerners from democratic nations. In spite of these constantly conflicting forces, King Fahd managed to maintain a stable balance. From the US point of view, the Saudi Arabian government was one of two allies in the region, Israel being the other. Yet while relations between Riyadh and Washington remained warm, not all Saudis felt that warmth toward the US or the West. In fact, Saudi Arabia, thanks to Wahhabi influence, remained a breeding ground for violent jihadism. Fifteen of the nineteen 9/11 attackers hailed from Saudi Arabia, and wealthy Saudi Arabians have consistently been a leading source for terrorist funding. 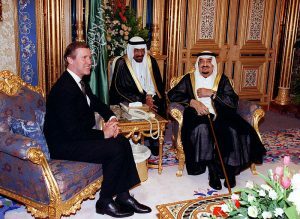 Yet the oil flowed to the West while Western cash fueled the extended Royal family’s lavish lifestyle. That oil wealth also fueled vast social programs and a bloated civil government that makes our US government seem almost efficient by comparison. In 1993, King Fahd sent shockwaves through Saudi society when he instituted a sixty person consultative council. All the members of the council were picked by him. It was nothing like “elected representation,” but by Saudi standards, but it was a huge step forward for Saudi society. Two years later, twenty women were allowed to attend the consultative council. To Westerners, it might seem like a miniscule token step toward liberalization, but to the Wahhabi religious leaders, it was wild heresy. King Fahd suffered a major stroke in 1995. His brother, Crown Prince Abdullah, acted as his regent and unofficial prime minister. When Fahd died in 2005, Abdullah ascended the throne and continued the balancing act. Like his predecessors, Abdullah was willing to use the Wahhabi establishment to maintain order and enforce their version of Sharia law in his Kingdom, but like every Saudi King, he was leery of their power. He continued to use oil wealth to further drive modernization and hold up vast social welfare programs while simultaneously struggling with the domestic terror issues caused by the radical Wahhabi influence. Gradually, King Abdullah implemented small steps toward liberalizing Saudi society. In 2007, he banned the infamous religious police from making arrests and began to institute major judicial reforms. Two years later, Abdullah pushed ahead with reforms and fired most of the senior judges and leaders of the religious police system. In 2011 the Arab Spring swept across North Africa and the Mid-East. When it reached Saudi Arabia, it was quickly stifled by police action. In September of 2011, King Abdullah announced that women would be allowed to vote in municipal elections and run for office. While Saudi women were quietly celebrating their newfound empowerment, the Saudi courts sentenced a woman to ten lashes for driving a car. King Abdullah overturned the verdict. In 2013, while Saudi Arabia continued to struggle to control domestic terrorism by homegrown jihadists, King Abdullah appointed thirty women to the consultative council. The following year, fearful of Iranian-backed insurgents in Yemen and the simmering unrest of the Shia-backed majority in Bahrain, King Abdullah did an about face in policy and introduced strict anti-terror laws. The new laws give the police the power to arrest anyone that protests against or speaks against the Saudi government or the Wahhabi religious establishment. The law even prohibits “thoughts” against the government or Wahhabi Islam. 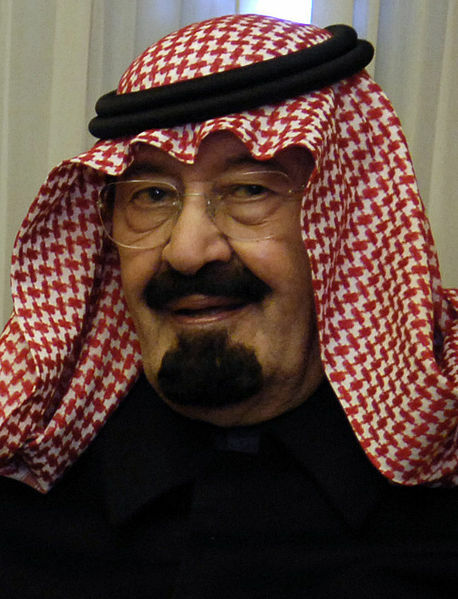 When King Abdullah died in January of 2015, his brother, Salman bin Abdulaziz Al Saud, ascended the throne. Image by Runab, wikimedia commons. Though Salman had supported King Abdullah’s reforms he was already eighty years old and in declining health. Instead of appointing one of his aging brothers as his acting regent, he appointed his thirty year old son, Mohammed bin Salman al Saud, as deputy crown prince and defense minister. The choice may prove to be an exceptionally bad one. Unlike his father and uncles, Mohammed bin Salman was educated in Saudi Arabia rather than in the US, and he is not well travelled. He has a reputation for arrogance and ruthlessness. Salman and his son face the same challenges that King Abdullah faced, but they lack one important resource that King Abdullah and his predecessors always relied on . . . They lack the cash. Oil prices have been down for the last couple of years, and that has forced the Saudi government to reduce the allowances of the extended royal family and to reverse the increases in social welfare programs that helped calm the attempted Saudi Arabian Spring. The fear in the house of Saud is showing. The new anti-terrorism laws are being rigorously enforced. Executions are at a two-decade high. There were 150 public beheadings in 2015. In the first week of 2016 alone, there were 47 executions by beheading or firing squad. In addition, popular blogger, Raif Badawi, who urged Saudi society to be more liberal and secular, was imprisoned in 2013 and sentenced to 10 years and 1000 lashes. His lawyer, Wahleed Abu al-Khair, was imprisoned in 2014. Now, Samar Badawi – Raif Badawi’s sister and al-Khair’s former wife – was arrested on January 12, 2016, along with her 2-year-old daughter. A long time human rights advocate, Samar Badawi’s crime was running a Twitter account to raise awareness of al-Khair’s situation. At this rate, the Saudis might have to use any money left over from their campaign in Yemen and their weapons acquisitions to fund new prison construction. On top of the domestic strain, on January 2, 2016, the Saudi execution of a prominent Shiite cleric led to an Iranian mob storming the Saudi Embassy in Tehran. Iran and Saudi Arabia then severed diplomatic ties. The current generation of Saudi leaders is under pressure, and it shows. The growing influence of Iran in the new Shia government in Iraq, the Iranian-backed rebellion in Yemen, the rise of ISIL in Syria, the increased Russian military presence in Syria, all combine to present what the young Saudis likely perceive to be a menace to their rule and their physical survival. When they add to that the American and Western “accord” with Iran, they may see themselves as being isolated while facing unrest at home and increasing threats by Iran. So where will the young Royals take Saudi Arabia? Mohammed bin Salman is planning major economic reforms. He will have to implement those reforms while dealing with Saudi Arabia’s expensive support for Sunni (non-ISIL) rebels in Yemen, the war in Yemen, and the brewing opposition at home. 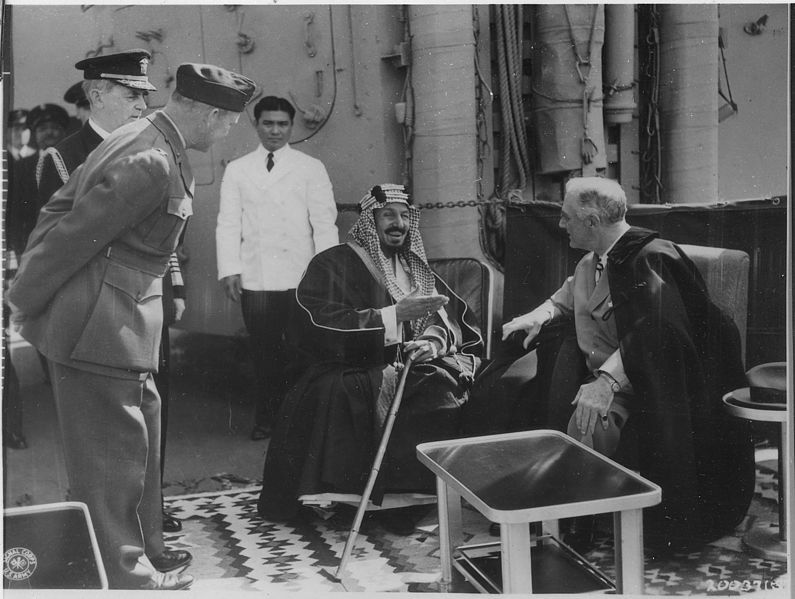 In 1928, King Ibn Saud came to power on the back of a fierce Wahhabi tiger. The house of Saud has never been able to completely dismount from that tiger. Since 1928, governing in Saudi Arabia has required an acrobatic balance of Wahhabi interests versus Saudi national interests. The future of Saudi Arabia depends on how well Mohammed bin Salman can ride that tiger. If they’re having that much pressure from low oil prices, it looks like it would be in their best interests to cut their production and try to get other OPEC nations to follow suit so the price could rise back up to a profitable level. Sub-$2 gasoline may sound nice, but $30 a barrel oil is ruining a large portion of our economy, as well as Saudi Arabia’s. It’s a case of oil producers “Chicken.” The Saudis and Gulf States are taking a “market share” approach. Russia is exporting large quantities of energy to Europe, and the Russians have stated that they will not cut production regardless of what OPEC does. Iran feels it can not afford to cut production and bet that a price increase will follow quickly enough. It is betting on outlasting the competition. Iran wants to fund major military upgrades. They want a serious IBM program, serious missile launching submarines, and an indigenous aircraft industry that will produce fighters on par with the West. In a country where scientists and engineers are quickly fired for failing to sing the “I love the Ayatollah” song high, tech programs are doubly expensive even when you steal the designs. The Iranian mullahs are certain that they can survive the low prices better than the Saudis can, and if Saudi Arabia falls into mayhem, Iran will be thrilled. Venezuela is a huge exporter of oil, but its economy is close to collapse, and Venezuelans refuse to suffer any short term revenue loss for a future profit. From Maduro’s point of view, tomorrow’s oil prices won’t matter if the palace guards kill him tonight. He desperately needs today’s income to make it through the day. OPEC nations and Russia are all convinced that US shale oil producers can not afford to pump at these low prices and that their temporary lapse in production will cause the price hike that they are salivating for. The Saudis have called for a %5 production cut, but the rest of OPEC is undermining that effort by pretending to agree to the cut without actually lowering production.